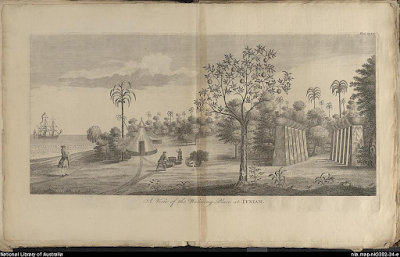 "A View of the Watering Place at Tenian," copperplate from A voyage round the world, in the years MDCCXL, I, II, III, IV by George Anson, Esq. 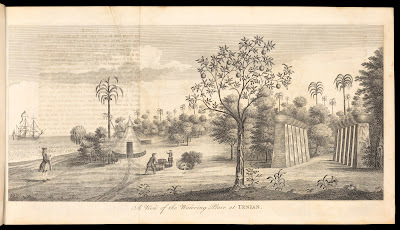 by Richard Walter, engraver unknown, 1748, National Library of Australia. "A View of the Watering Place at Tenian," copperplate from A voyage round the world, in the years MDCCXL, I, II, III, IV by George Anson, Esq. 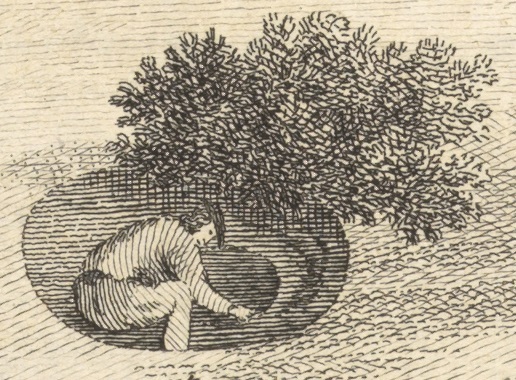 by Richard Walter, engraver unknown, 1748, Getty Research Institute. The rewards George Anson and his surviving crew reaped from capturing a Spanish treasure galleon are legendary. A huge haul of cash that was a major boon to the English and a major blow to the Spanish. In the celebration of Anson's victory, the troubles that plagued his arduous voyage around the world were seen as mere stepping stones. In truth, most of the effort in Anson's expedition was expended on base survival. One of those day-to-day tasks for survival is depicted here. Late in his voyage, Anson stopped at Tinian Island. 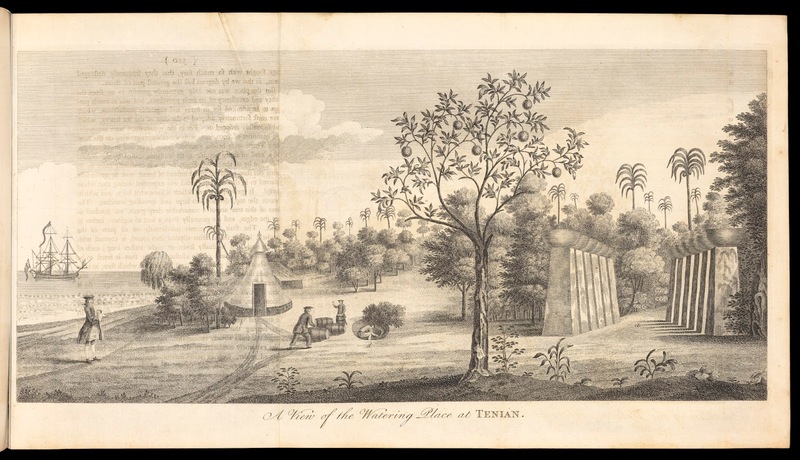 The inhabitants of Tinian had been forcibly moved to Guam by their Spanish oppressors, and the spot was largely uninhabited. This allowed Anson to bring aboard much needed water for the voyage. 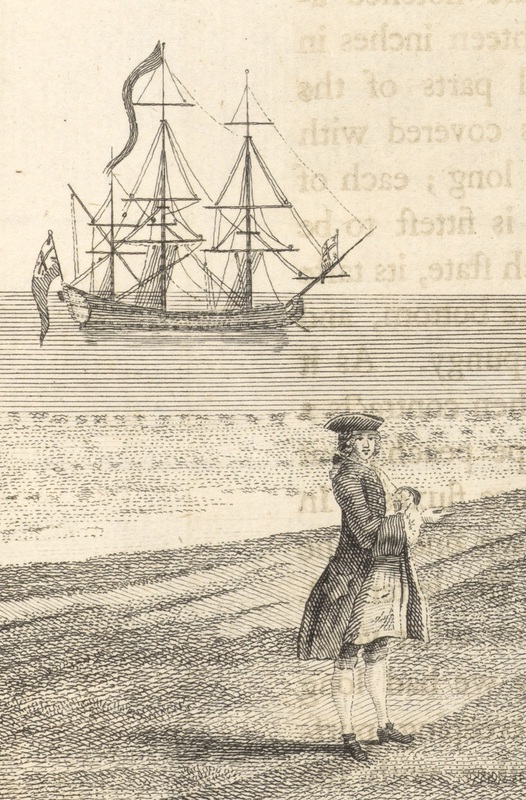 It is this scene that Richard Walter is portraying in the copperplate above. 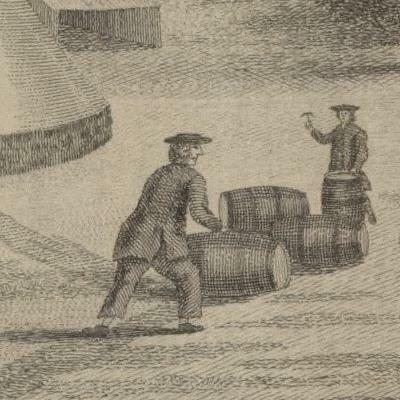 Here, two sailors work at sealing and moving barrels of water. The fellow in the background wears a cocked hat reversed and single breasted jacket. His hair is cut short and hangs above his shoulders. In the foreground, his mate wears a flat crowned round hat and short curly hair. His jacket is double vented at the back, and he wears trousers that hang above the ankle, near the bottom of the calf. To the right of these two mariners is a sailor who appears to be digging a well. His hair is wavy and shoulder length, hanging from under his flat crowned round hat. He wears a jacket tucked into the waistband of his long trousers. I do believe this is the man himself: George Anson. Afloat in the background is the legendary Centurion.